Starcraft, Me and the SEA. : Merry Christmas! I got...friendzoned by a bank scam email?! Merry Christmas! I got...friendzoned by a bank scam email?! Sofia I trusted you! Women honestly they expect you to save them from their uncles assassinating them, handle their 5.6million dollars and they expect you to just be friends and have a platonic relationship after going through so much together?! hope you guys find it amusing. Some woman only know the word "take" and not the word "give"! Good luck to her! I hope she ends up as a prosititute and has to learn about giving and taking and there interrelationship! Yeah they are truly crafty, damn scammers. Merry Christmas! Merry Christmas to New Zealand! Well you've already ruined it anyway by not keeping it to yourself. Happy Holidays. I am tired of getting spam all the time. Have a Merry Christmas too! Crazy world nowadays, isn't it. Merry Christmas though! Happy Holidays DIE SPAM !!! Good evening to you and Merry Christmas! I feel a connection and would also like to be your sister. But please give me all your bank details first then your shoe size then your actual weight and any cats you own. You should attempt to counterscam her/him. By actually getting him into the country then leaving him/her there. That so silly. Scammers are losing their touch I see. 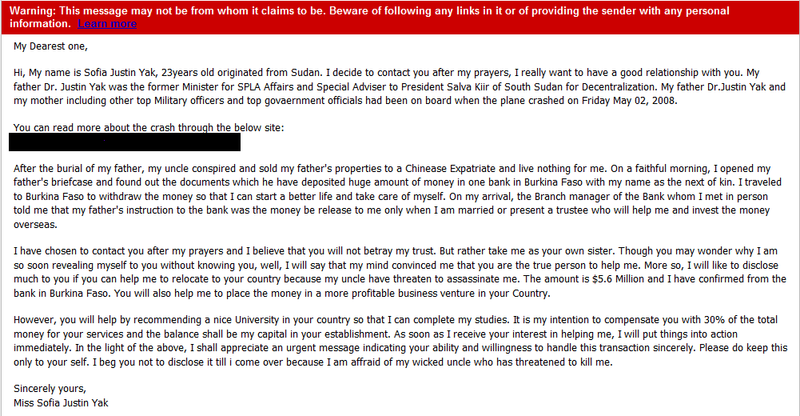 I really wonder where these scammers come up with this stuff. And are there idiots out there who actually believe them?? She could have at least said a third cousin, because in some states there would be potential.